Teqball, a Hungarian invention, is based around a specially-engineered curved table, can be played indoor and outdoor, and is designed as a training tool suitable for professional footballers as well as amateur enthusiasts, as well as being a game in its own right. The rules of Teqball are fluid in that the players can create their own set of criteria and skills training routines using the table, but the investors have come up with a basic rubric. within a play. A player can return the ball with the same body part only two times consecutively. These rules make the game spectacular. Teqball can be played by 2 players (singles game), by 3 players (Canadian doubles), by 4 players (doubles game) or even by several more players similar to the ‘Round-the-table’ game in Ping Pong. Created by Gabor Borsanyi, the business brains behind Teqball come from the multi-national Docler Group which employs more than 1,000 people worldwide, with offices in Los Angeles, Hong-Kong, Luxembourg and in Budapest, Hungary. Chairman Andras Somkuti has led the project from their end. 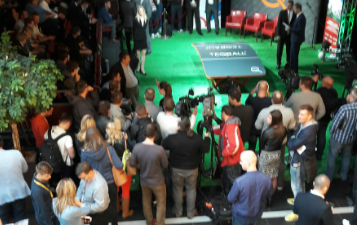 At the launch Hungarian minister of state for human resources management, Dr Tünde Szabó, announced government support for the project, saying “it is amazing how Teqball can improve a player’s technical skills”. 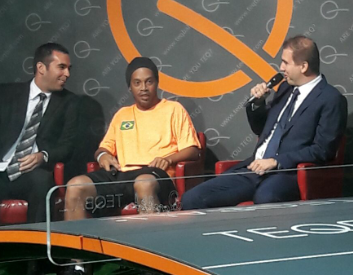 Ronaldinho invited Messi and Ronaldo to play a game of Teqball and sent them each a table as a present. With a number of clubs, players and coaches already praising the values of Teqball, it is very easy to see the tables rapidly becoming an important addition to a club’s skills training equipment, while adding a competitive element to that training. The inventors have even more ambition for Teqball, hoping that it could become an Olympic sport in 20 years. If angling is poised to enter the games, why not Teqball?